The CME recognizes nine major U.S. holidays annually. We’re approaching one soon. Independence Day, also known as July 4 or the “Fourth of July,” is next week. 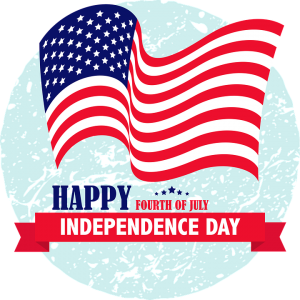 July 4 is a federal holiday that recognizes the anniversary of the U.S.’s independence from Great Britain since July 4, 1776. Because the markets will close early, you may be able to enjoy some grilling and fireworks. Be careful though leading up to the holiday, as markets tend to slow down or move more randomly than usual. Also, make sure that you’re not in an open position when the market closes early. If that were to happen, you should call your broker right away. If you want to read the official notice from the CME, click here. Note the times are provided in an Excel spreadsheet. The Compact version is a bit easier to read. Better yet, just read our notes below. We do not mention commodities like grains or dairy because we’re not interested in them. The E-mini (the main market we trade) is considered a CME equity product. Tuesday, July 3, 2018: Equity and Bitcoin markets close early at 1:15 p.m. EDT (UTC-4). Note that forex, interest rate, energy, metal, and DME markets will be open normal hours. What Comes After July 4? The rest of the week, expect normal market hours. What holiday is next? Labor Day in early September. Are you ready to gain your independence from under-performing trading systems? Sign up for the Group Mentorship class that begins July 2 and you’ll be marching to the beat of a new drummer in no time. We’ll help you recognize military candle formations, and find the discipline and skill to be at the frontlines of the markets. Think of it like a trading boot camp that gives you all the courses, software, and techniques in eight short weeks. Our goal is to deploy you as an independent, capable trader. My name is Carl and I am an experienced day trader. I’ve been trading for over 20 years. Regularly, I am approached by new and experienced traders who ask the same question. They want to know the best way to learn how to day trade. It’s easy to find programs and courses that make big promises. Unfortunately, the industry contains too many products that do not deliver. Because of my experience working at a top U.S. trading firm and years of refining my approach, I can share my techniques with you. Learning to day trade should be a straightforward process. Learn how to spot trades with high potential. Learn how to use the trading platform to ensure your trades are being placed correctly. If you can master these concepts, you could very well be on your way to becoming a successful trader. There are about two ways to become a trader: self-education and experimentation or learning from a reliable coach. The former way requires a serious time commitment and thousands of dollars. Yes, to self-educate, you will be on your own to learn how the trading platform works. This is certainly possible, but you will need to run trading software during the ideal times to trade to truly get a feel for what it’s like to trade in live conditions. Many people are at work and cannot install trading software on work computers or regularly take time off to develop trading skills. Some trading platforms like NinjaTrader offer Market Replay (also called Playback Connection) that let you play back previous market activity as though it’s live. This is a great feature. However, you will still need free time in the evenings or before work to practice. Most of us lead busy lives with family and other obligations. Is devoting one hour a day to learn and practice enough? Maybe not – a common rule of thumb is that it takes 10,000 hours to truly become an expert. Practice makes perfect, but perfect practice hastens skill development more efficiently. Another problem with the “teach yourself” route is money. Not all trading platforms offer free real-time data, which is crucial for proper practice. Those that offer such data may do so in a limited trial basis. Furthermore, this problem is compounded if getting real-time data requires you to pay for it; whether outright or via a broker who offers this data after requiring a hefty deposit to set up a simulated account. And then we must consider the inevitable. After trading for a while, it’s possible you may be tempted to see what trading with real money is like. After funding your account with thousands and possibly purchasing a license for your trading platform, you could lose much more money without a proper trading technique. Just because you developed a strategy that has been profitable for a couple of weeks, that does not mean it will continue working as well in the future. It may be best to instead learn a tried and true technique, which brings us to the suggested way of learning to day trade. Indeed, when asked about the best way to learn day trading, I recommend learning from an experienced mentor. A mentor is someone who has real trading experience and can actually teach. Not all successful traders also possess the skill to educate others. This is why I help traders learn through an eight-week coaching program called Mentorship. In this coaching course, I teach traders from all skill levels and backgrounds my proprietary techniques that have been refined over the years. My goal is to make you a competent trader who can face whatever the market throws your way. In total, expect to learn over 10 price action methods. This means that you’ll learn how to spot exact patterns and what to do when they occur – how to place your trades, risk mitigation, and looking at performance. The instruction is online in a webinar format. This allows me to engage with traders from all over the world. I also conduct one-on-one sessions for those looking to receive personal attention or have unusual schedules. In my opinion, this truly is the best way of learning to day trade. If you want to learn more and sign up for the next class, click here to become a professional day trader. Chances are, you probably have not developed a winning trading strategy on your own. In fact, it’s common to waste time trying to invent a new approach when nearly everything has been tried and done before. Just because you have identified a pattern that worked for four days in a row, do not expect the method to continue working long into the future. By all means, test it and keep track of performance, but have reasonable expectations. Wouldn’t it be easier and faster to go with something tried and true? Join our next Group Mentorship class, which begins July 2, 2018. Through our eight-week Mentorship Program, we’ve helped dozens of traders learn our strategies that have been tested for years. The program is designed to put you in a live webinar room where the instructor is reviewing the current day and recent day chart activity, identifying patterns, and explaining how to spot trades and what to do with them. This means that no stone is left unturned. Trade management, profit targets, stop losses, and all the details are fully explained. The goal is to turn you into a professional trader by eight weeks. The support does not stop there. We can help you install the materials via remote assistance. In addition, the lessons are recorded and provided to you within an online portal. Yes, in the future, you can log in and watch class recordings. It’s a great refresher that many of our students appreciate. We take a price action approach. If it’s not visible on the chart, we don’t trade it. We trade on what we can objectively observe. No trade? No problem. All criteria met? That’s a trade! Here’s a link to the Mentorship Program page where you can find out all the details. The next class begins July 2, 2018. We expect it to fill up quickly, so enroll early! With your deposit, we’ll provide the first week’s course and software right away (ATO 2 trading strategy). This way, you can start practicing with one of our strategies before class begins. Have questions? If you prefer email, use [email protected] Alternatively, call us at 888-607-0008. Monday, May 28, 2018 is Memorial Day here in the U.S. Because it’s a fairly significant holiday, popular markets close early. Specifically, the E-mini S&P 500 halts trading at 1 p.m. ET and reopens around 6 p.m. ET. Yes, you will be unable to trade for about five hours. Other CME products will be impacted, specifically those in the equity, interest rate, FX, NYMEX & COMEX categories. If you’re in a different time zone, remember to convert the hours. ET is UTC-4 (New York time). 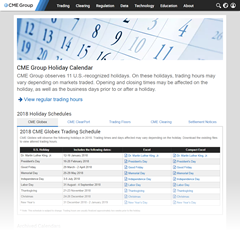 Take a look at the official trading calendar from the CME. A number of trading holidays are listed. When is the next trading holiday? July 4, 2018 is Independence Day. July 4 is a Wednesday, so you can expect reduced trading hours. Expect another post on that closer to that date. Friday, May 25, look for slower than normal market conditions. The Friday before a three-day weekend/holiday tends to be slower. Slower market activity tends to chop back and forth, which can increase risk. Tomorrow, March 8, is rollover day for the E-mini and other index futures! You will need to follow the NinjaTrader rollover instructions below. Rolling over is important – otherwise, you’ll be trading an oudated contract that will soon expire. Outdated contracts will start to show weird-looking market activity, like many dojis during peak hours. If you see that type of thing, then you’re probably late in rolling over. Generally, we recommend that you check for rollovers about once a month. Just follow the same steps below and roll over any instruments (markets) that NinjaTrader detects. Yes, we will be addressing this message that NinjaTrader produces as a warning for an upcoming rollover. In NinjaTrader’s Control Center, at the top of the window, go to Tools > Database Management. Now you should be looking at the Database Management window. NinjaTrader should detect all of the instruments (markets) that need to be rolled over. Click the Rollover button and all of the instruments will be rolled over. Yes, it’s that simple! By the way, if you’re following these steps prior to March 8, you probably won’t see the ES listed. Remember, NinjaTrader is only showing you the markets that need to be rolled over on or after the roll date. What are the roll dates? Here’s a list from the official source, the CME. Okay, now your contracts should be rolled over. Wouldn’t it be cool if you went back to your charts and saw that the markets automatically rolled over after you clicked that rollover button in the last step? Well, that’s exactly what should have happened. Look at the top-left of your chart and you should see ES 06-18 instead of ES 03-18. Yep, that’s all you have to do! Enjoy trading the ES 06-18 for another three months. In June, you’ll need to roll over to the September contract. Remember that the E-mini uses a quartlerly contract expiration cycle, so every three months, you’ll need to roll over. Some markets like the CL roll over more frequently. We recommend that you go to the Database Management screen monthly and roll over whatever NinjaTrader is showing. This way, you develop a good habit and better ensure your contracts are up to date. Some trading platforms use a “continuous contract” that automatically rolls over for you. NinjaTrader takes a manual approach, but they make it pretty easy. Another thing to consider – some traders prefer to wait to roll over until the volume has shifted to the new contract. 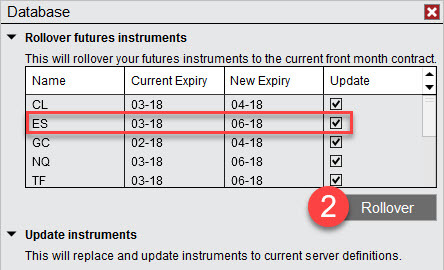 For example, a couple days later, the volume in the ES 06-18 contract may finally be greater than the ES 03-18, and at that time (days after the actual rollover date), they will switch. This is a “follow the volume” approach. Some traders like to trade where there is the most liquidity. 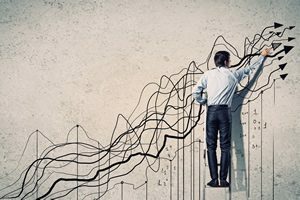 2018 Stock Market Trends: What Can We Expect? This 2018 stock market activity has been wild. In late January of 2018, the media reported on the stability of U.S. financial markets. Basically, the reports focused on the unwavering growth of U.S. stocks since the 2016 election. Many articles stated the markets seemed to be perpetually stable. Then about two weeks later in early February, the stock market was a much different place. The Dow experienced its largest single-day loss ever. By using an E-mini S&P 500 daily chart, we can see how price dropped over 300 points within a few days. Unquestionably, investors were hit hard. Many of the same media outlets now summarize the activity as a crash. Who would have thought such a thing would happen out of the blue at the start of a new year? There are several theories as to why this happened. Perhaps it’s a combination of all of the following or none of the following contributed. U.S. economics is an extremely complex subject with many layers and variables. The bottom line is that we simply don’t know and we may never know. Where does this leave you as a standalone, retail trader? Well, if you’re tried to trade lately, you’ve probably noticed the increased volatility. “Increased” is an understatement. In some cases, we’ve seen the volatility quadruple what we normally consider high levels. For example, the ATR (Average True Range) can be used as a volatility indicator. We consider an ATR of four relatively high. Lately, we’ve seen the ATR approach 20. If you’re trading, your profit target or stop loss can be hit so quickly, that you don’t have time to prepare for the outcome. If you must trade, use ATM Strategies because it may not be humanly possible to react in time. A smarter approach is to practice in simulation mode, so that you can at least get a feel for the flow of the market. Many clients have been staying out entirely, and for the most part, we agree with this approach. Being a winning trader is about placing the trades and knowing when it’s too risky to bother trading. What will happen in the 2018 stock market? No one knows. However, we put together this video showing that 2018 may be an up year because of the January Effect. The January Effect was correct in predicting that 2017 would close higher in December than January. If the same holds true, we could be looking at a recovery in the coming days or weeks. This presents a potential winning opportunity to go long on a retracement. Yes, this is very high risk, so we understand if you want to wait until the E-mini’s volatility returns to that acceptable one to four-point range we typically see. Whatever happens, we’re in for a ride!